“Whatever the anticipated verdict of the tribunal [in my father’s case] will be, we are not concerned about it at all. We instead wait for the Divine verdict/justice from almighty Allah,” says Mr Amaan Azmi, son of Prof Ghulam Azam who is awaiting the verdict in the case against him for war crimes. Amaan Azmi stated that those who associate his father with crimes against humanity are morally sick people who are falsely accusing his father. The case against Prof Gulam Azam has been listed for pending verdict, expected within the coming days after the court hearing was completed last week. Mr Azmi has said relatives visited his father on Sunday. They will be able to visit him again in 2 weeks time. Mr Azami says about the verdict, “We do not know whether we will get the fair justice or not. We should not comment about the verdict before it is delivered. We will appeal if the verdict goes against us. 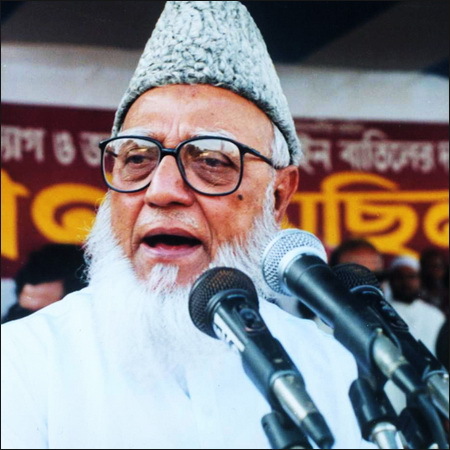 Professor Ghulam Azam was not a lighthouse of a criminal campaign; rather he worked as a lighthouse for the Islamic and democratic movement in Bangladesh. The prosecution has utterly failed to produce any evidence required for conviction and punishment in a criminal proceeding. A judgment cannot be based on emotion but on the evidence. The case against Prof. Ghulam Azam on the charge of his alleged involvement in crimes against humanity is full of emotion and concocted stories but what it is missing is evidence. Let’s now analyze the case of Prof Ghulam Azam. Prof Ghulam Azam has been charged with the murder of police inspector Miru Mia on the basis of an alleged letter of Prof Ghulam Azam. However, the alleged letter has not been recorded as evidence in the Tribunal. None amongst the collector, conveyer or bearer or the addressee of the alleged letter has been called as witness to the Tribunal. This means that the prosecution has not been able to present any evidence. They have merely concocted baseless stories. 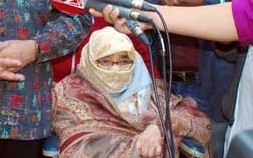 It is stated that Prof Ghulam Azam conspired with Tikka Khan. However, no witness has confirmed this. No documents have been submitted in support of this. A political party chief can surely meet an army general of the country at a discussion table. Nobody can deny that Sheikh Mujib also held meetings with Bhutto. What matters here is that no evidence was produced or no witness was brought in the Tribunal to prove what Prof Ghulam Azam discussed with Tikka Khan that should constitute conspiracy. Prof Ghulam Azam has been charged with the murder of 38 freedom fighters in Brahminbaria jail at his written instruction. However, no evidence has been presented in the Tribunal as to who was the messenger of his written instruction, to whom it was addressed, what was written in that letter. Furthermore, no existence of any such letter has been established. Superior or command responsibility only applies to the military and not to civilians. The Defence Counsel had presented a list of 2,939 witnesses in defence of Prof Azam. The prosecution protested the list, at which the court told the defence to present a fresh list of no more than 12 witnesses. No such arbitrary limit was placed on the prosecution, who presented 16 witnesses – 4 more than the defence. It is also interesting that with no limit placed on them, the prosecution was only able to present 16 witnesses against Prof Azam’s 2,939. It is clear how partial and unfair this court is in openly pandering to the prosecution and hindering the defence. Later the court forced the defence to conclude Prof Azam’s defence on a single witness. None of the documents of the prosecution was prepared by the investigating officer, Matiur Rahman, but were created by Dr Ahmed Ziauddin. Dr Ahmed Ziauddin created them in connivance with the prosecution and submitted to the Tribunal in the name of the prosecution. This is fraud. Whatever Justice Nizamul Haque has issued in the Tribunal including the charge sheet and orders, nothing is his own deliberation. Everything is prepared by Dr Ahmed Ziauddin from abroad. Nevertheless, Justice Nizamul Haque later passed those as his own deliberation. By this he has committed fraud and misconduct. As such this trial is entirely discredited. Five drafts of charge sheet against Prof Ghulam Azam came from Belgium resident Dr Ahmed Ziauddin. Furthermore, it is Ziauddin who from Belgium determined as to whom should be selected as witnesses and what statements should be solicited from the witnesses etc. On 12/05/2012, from Belgium Dr Ahmed Ziauddin sent the last draft of the charge sheet against Prof Ghulam Azam via email to Justice Nizamul Haque. Justice Nizamul Haque copied the same draft in verbatim and issued the charge sheet order against Prof. Ghulam Azam on 13/05/2012. As such this tribunal has been heavily manipulated from abroad by a person with no official role in the court and whose role in the court was not made known and kept concealed until it was exposed by the Skypegate scandal. Following the scandal, the tribunal Chairman, Justice Nizamul Haque resigned, yet these fraudulent activities were not rejected and the trial continued as if nothing happened. Under such circumstances, the trial of Ghulam Azam cannot be considered credible or fair. 1. Prosecution failed to give specific/ substantive evidence to prove any of the allegations brought against PGA. 2. Prosecution termed PGA as Lighthouse. Defence Lawyers agreed saying, “Yes, of course he is. He is the Lighthouse for re-establishing Democracy in this country, being the founder of Care Taker formula in the 80s. He is also a Lighthouse for all Islam loving people of this country”. 3. Defence Counsel said, “If PGA gets fair judgment, it is not possible for the court to sentence him for even ‘1’ minute. Rather, for bringing false allegation, Prosecution and Investigating Officer could be punished”. Please pray for a fair judgment. With due respect to all those who post derogatory comments about Prof Ghulam Azam (PGA), my earnest request to you is to please READ the following CAREFULLY WITH AN OPEN MIND. If, even after that, you think what you posted is true, I can only say, “Sorry, LET US AGREE TO DISAGREE”. And, please remember that this is an academic forum, and it is desirable that no one uses indecent language here, because it will only speak ill of the person who uses filthy language. Please use your HEAD (sense) and don’t be swayed by media propaganda. Try to know the fact/ truth and use your logic to come to conclusion. Combine HEAD & HEART, and not heart alone. That is what intelligent/ sensible people do. It is imprudent to decide/ conclude purely based on emotions, without using HEAD. (1) PGA was NEVER in any govt position in his whole life, NOT even in 1971. How can he have formed and led those forces? Is there any document to support your claim? In the Tribunal, the Investigating Officer (IO), a police officer, after years of investigation, could not produce a single document to justify that he (Prof Azam) formed and led these forces. In fact, there are Gazettes issued by Pakistan Govt in 1971, decreed through the civil servants of that time, including the present Home Minister, which ordered formation of these forces and placement of these forces under Pak Army. How is it possible that a civilian, without any portfolio in any capacity, can have formed and led/ controlled/ directed those forces placed under command of army? (2) Please be informed that, Mr Abdur Rahim, who was a DIG of Police in 1971, was the Director of Razakar in 1971. After independence, he was promoted as a Secretary to the Govt of Bangladesh. Great reward indeed. No allegation against him because he is not a political threat to the govt. (3) All civil servants, police officers, university/ college/ school teachers and all other job holders, who continued to work under Pak Army in 1971 (including Muntassir Mamun’s father who worked directly under Pak Army in Chittagong Port, and his 2 uncles, the present Home Minister and a Dhaka University teacher) were absorbed in their respective positions after 16th December 1971. This includes those who were involved in ordering recruitment, organizing, arranging training, procurement, provisioning, payment of salaries, imposing punishments etc were absorbed by the Bangladesh govt soon after victory. Not only that- almost all of them were promoted to higher positions. And, these are documentary. None of them are charged with any offence committed by Razakars in 1971, whereas PGA is being alleged without any proof or document! Ridiculous!! How justified is it? Is there any answer to this? The truth is, the people who are unable to face him ideologically and politically have been and still are using media to spread venom against him. I challenge any person on this God’s earth to come out with any proof s/he may have to justify the allegation of PGA’s possible involvement of any kind in organizing, recruiting, forming or leading any of these paramilitary/ auxiliary forces named. I bet my life, there isn’t any, because these are all lies. Had there been any such proof, it is quite natural that the IO would have submitted those in the tribunal, which he didn’t, because he couldn’t since these are false allegations. SO, IF NO ONE CAN GIVE ANY PROOF, I WOULD HUMBLY SUBMIT TO EVERYONE’S GOOD SENSE NOT TO BELIEVE OR SPREAD LIES. (4) Talking about Peace Committee of 1971, please be informed that, its Central Committee had 140 members, in which he (PGA) was just simply a member, NOT even a small office bearer. How could a simple member of a committee do all the crimes, while people like Chairman, Vice Chairmen, Secretary, Joint Secretaries, Office Secretary, Treasure and other office bearers were all innocent? Is it logical? Is it acceptable? Any sensible person would not accept this argument. Does anyone even know who they (officials) were? Hardly few would know few other names other than PGA. Why then PGA is only under trial, and NO ONE else? The answer is simple – the govt is unable to face PGA ideologically and politically. (5) PGA appealing (NOT apply) for not recognizing Bangladesh after its birth is an UTTER LIE. Does anyone have any proof that he even appealed for a single time, what to talk of 7 times? IMPOSSIBLE, because there isn’t any element of truth in this. Rather, it was he who tried to persuade Saudi govt, by personally meeting the Kings (King Faisal in 1972 and 1973, and later, King Khaled in 1975) several times, to recognize Bangladesh, and it was because of his untiring effort, personal influence and persuation that the Saudi Embassy was established in Bangladesh in 1977. The sad part of history is that, we know little, and are not interested to find out the truth, but are highly moved by the propaganda of the evil doers. Again, using heart without head!! (6) If PGA is really a criminal, then WHY: (a) BAL did movement together in 1980s against President Ershad and in 1990s, against BNP? (b) BAL sought his party’s support to form govt in 1991by offering 2 ministries and 7 female MP seats? (c) BAL nominated President candidate, Justice Badrul Hayder, personally met PGA and sought his party’s support in 1971? THERE ARE MANY OTHER QUESTIONS ON THIS ISSUE. THERE ARE ALSO MANY QUESTIONS REGARDING THE VALIDITY, NEUTRALITY AND TRANSPARENCY OF THE TRIBUNAL!! I would conclude by requesting all concerned to know our true history before concluding/ judging/ jumping to conclusion. Please do not nourish/ nurture lies, because that only spreads venom and develops hate culture, which is detrimental to our progress and prosperity. May Allah guide us all in the right path and help us to seek truth.